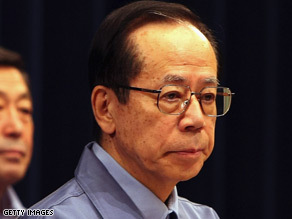 TOKYO, Japan (CNN) -- Japanese Prime Minister Yasuo Fukuda, whose popularity plummeted after his government introduced a much-criticized medical plan for the elderly, has announced his resignation, according to media reports. No-confidence motion was a stinging rebuke for Yasuo Fakuda, analysts said. Fukuda, who has been in office lass than a year, made his announcement at a press conference Monday night, the Kyodo National News Agency said. The 72-year-old prime minister said he made his decision last week, and was stepping down because of the difficulties he has had in carrying out policies, Kyodo said. "It is necessary to try to implement measures under a new framework," Fukuda said, according to the news agency. "I thought now is the best time (to resign) to avoid a political vacuum." It was not immediately clear when the resignation would take effect. Fukuda said he had asked his party, the Liberal Democratic Party, to hold an election to pick his successor. Fukuda took office less than a year ago after his predecessor, Shinzo Abe, resigned after just 12 months in the job. The medical plan, introduced in April, raises premiums for people over age 75 and deducts health-care expenses from pension payments. In June, Japan's opposition-controlled upper house of parliament approved a motion of no-confidence in Fukuda. It was the first time a chamber of parliament has passed such a censure in the country's post-war history, but the motion was non-binding and largely symbolic. No-confidence motions only count in Japan when approved by the lower house, which is currently controlled by Fukuda's political party. Still, analysts said the no-confidence motion was a stinging rebuke for the prime minister. A slowing economy added to Fukuda's sagging political clout. In order to boost his approval rating, he reshuffled his Cabinet over the summer and unveiled a stimulus package last week. Neither move helped boost his popularity.